Our records indicate that xxxxxx@gmail.com requested and confirmed to be added to AwesomeStocks.com. MNGA has been consolidating in what appears to be an area of increased support for the past two weeks. 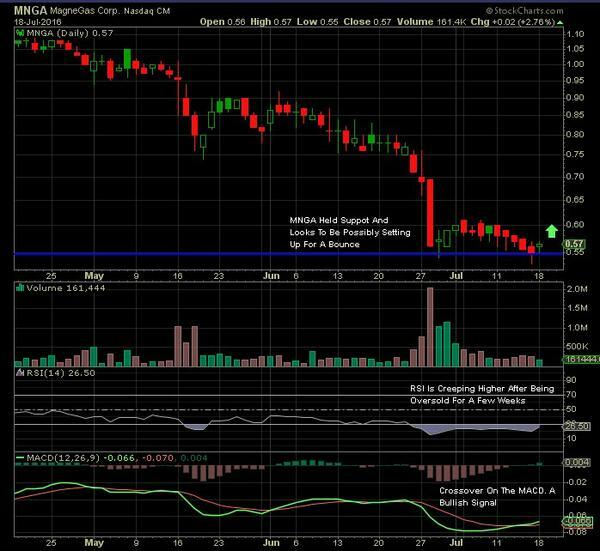 MNGA experienced a reversal candle yesterday, increasing the potential probability of further upside. MNGA is trading below its 20 DMA (day moving average) by 10%, which suggests an opportunity to experience gains. MNGA has an RSI on the daily chart of just 29, suggesting a potentially oversold valuation. Based on MNGA's historical volatility, there is an increased opportunity that MNGA, if it surpasses its 20 DMA, may test its 50 DMA (currently at 0.77). Technically such a move would suggest potential upside of 35%. In addition, MNGA has a bullish MACD crossing that is suggesting that there may be increased upside in the near future. We first alerted MNGA on May 6, 2015 at 0.78. Afterwards, MNGA rallied to a high of 1.58 two weeks later for upside of 102%. Timelines are to be decided by you. Approach methodically, and seek technical confirmation for direction. Keep calm. Decide for yourself if you like the trade. If you are not comfortable with the perceived risks, stay out. If you decide to trade, trade with a strategy in mind. All strategies are outdated the minute they are created. Make sure to stay realistic with the changing market circumstances. Always use limit orders (buy and sell). Protecting your investment is more important than missing gains. Use "trailing stop %" or "trailing stop $" orders. Note: If you are unable to place an order using your online brokerage interface and are instead required to call the broker or go through extra hoops then it may be best to stay away from the trade alert on grounds that you are losing valuable time to secure the best potential gain opportunity. This report/release is a commercial advertisement and is for general information purposes ONLY. We are engaged in the business of marketing and advertising companies for compensation. Never invest in any stock featured on our site or emails unless you can afford to lose your entire investment. This disclaimer is to be read and fully understood before using our services, joining our site or our email/blog list. This report/release is not a solicitation or recommendation to buy securities of the advertised company. An offer to buy or sell securities can be made only by a disclosure document that complies with applicable securities laws and only in the States or other jurisdictions in which the security is eligible for sale. Reports/releases distributed through disseminated emails are not disclosure documents. If you are considering purchasing any securities of an advertised company, you should read and review, if and to the extent available, any information concerning a marketed company available at the web sites of the U.S. Securities and Exchange Commission (the "SEC") at www.sec.gov;the Financial Industry Regulatory Authority (the "FINRA") at www.FINRA.org and your State Securities Administrator. We also strongly recommend that you read the SEC advisory to investors concerning Internet Stock Fraud at www.sec.gov/consumer/cyberfr.htm, as well as related information published by the FINRA on how to invest carefully. You are responsible for verifying all claims and conducting your own due diligence. You agree and acknowledge that any hyperlinks to the website of (1) an client company, (2) the party issuing or preparing the information for the company, or (3) other information contained in our disseminated reports/releases is provided only for your reference and convenience. We are not responsible for the accuracy or reliability of these external sites, nor are we responsible for the content, opinions, products or other materials on external sites or information sources. If you use, act upon or make decisions in reliance on information contained in any disseminated report/release or any hyperlink, you do so at your own risk and agree to hold us, our officers, directors, shareholders, affiliates and agents harmless. You acknowledge that you are not relying on us, and we are not liable for, any actions taken by you based on any information contained in any disseminated email or hyperlink. You also acknowledge that we are not an investment advisory service, a broker-dealer or an investment adviser. You acknowledge that you will consult with your own advisers regarding any decisions as to any company mentioned here. AwesomeStocks.com is compliant with the Can Spam Act of 2003. AwesomeStocks.com does not offer such advice or analysis, and AwesomeStocks.com further urges you to consult your own independent tax, business, financial and investment advisors. Investing in micro-cap and growth securities is highly speculative and carries and extremely high degree of risk. It is possible that an investor's investment may be lost or impaired due to the speculative nature of the companies profiled. We have not determined if the statements and opinions of the message are accurate, correct or truthful. The profiles we publish are compiled from publicly available information, which include, but are not limited to, no cost online research, magazines, newspapers, reports filed with the SEC or information furnished by way of press releases. Because virtually all information relied upon by us in preparing an Issuer profile comes from a public source which has been made public directly from the Issuer, the information is not confirmed with a second source. The purpose of this report/release, like any promotion, is to provide publicity for the client company, its products or services. Owners and operators of AwesomeStocks.com have been compensated twenty five thousand dollars cash via bank wire, earned upon receipt, for distribution of our opinions and publicly available information for MNGA from Media Network Consultants on 07/18/2016. Previously owners and operators of AwesomeStocks.com have been compensated one hundred and one thousand dollars cash via bank wire, earned upon receipt, for distribution of our opinions and publicly available information for MNGA - this contract has expired. Owners and operators of AwesomeStocks.com do not hold any stocks or bonds in mentioned company as of 07/19/16. You should not rely on the information presented; you should do independent research to form your own opinion and decision. Information contained in our disseminated emails does not constitute investment, legal or tax advice upon which you should rely. The purchase of high-risk securities may result in the loss of your entire investment. Full disclaimer can be read at www.AwesomeStocks.com/Disclaimer. The Private Securities Litigation Reform Act of 1995 provides investors a 'safe harbor' in regard to forward-looking statements. Any statements that express or involve discussions with respect to predictions, expectations, beliefs, plans, projections, objectives, goals, assumptions or future events or performance are not statements of historical fact may be "forward looking statements". Forward looking statements are based on expectations, estimates, and projections at the time the statements are made that involve a number of risks and uncertainties which could cause actual results or events to differ materially from those presently anticipated. Forward looking statements in this action may be identified through use of words such as "projects", "foresee", "expects", "will", "anticipates", "estimates", "believes", "understands", or that by statements indicating certain actions & quote; "may", "could", or "might" occur. Understand there is no guarantee past performance will be indicative of future results.